Discussion in 'Announcements' started by Info, Nov 2, 2018. This Live Stream will cover many important topics relating to our revolutionary secure private messaging app that allows you to enjoy secure private communication with friends, family and colleagues. These topics range from Technical Developments, Commercial, Promo and Pricing Strategies to a look at the team changes at Crypviser and our plans for the next 12 months. In attendance will be Crypvisers CBO Gareth Leggett, CCO Mark Babbitt, Director of Business Development Manuel Schütz, and CEO Vadim Andryan. We are all very excited to speak about what has been going on with Crypviser. The CBO Gareth Leggett will be introducing the actual business, commercial and promo plans for our commercial start with a new pricing model. Mark Babbitt the CCO of Crypviser will talk about the current development plans, past events from Hackit to the Brazilian Conference, and to others which are still planned for this year. 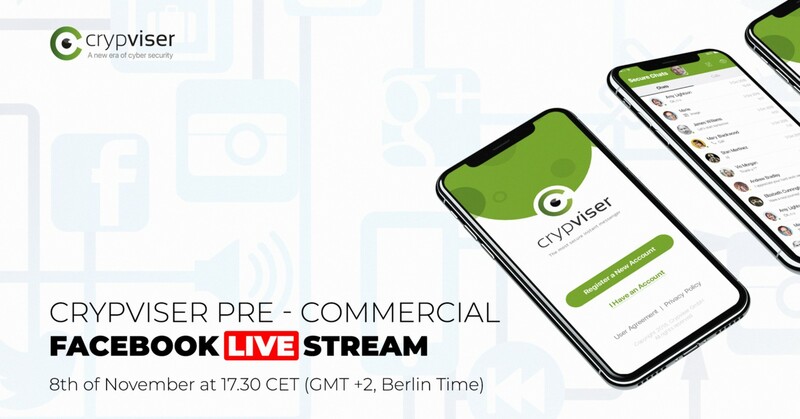 We are looking forward to hearing from our Long Time Supporters and excited to hear from people who are new to Crypviser.